MERRIMACK – The University of New Hampshire football program has certainly gone national, recruiting from all over the nation. One of the things that makes coach Sean McDonnell’s program so special is that it continues to keep the Granite State’s top talent at home. Wednesday on National Signing Day, the Wildcats added 10 names to the rosters, including the Granite State’s Gatorade Player of the Year, Andrew Duval of Goffstown and Merrimack sensation Joe Eichman. The Tomahawks’ senior lists as a 6-foot, 190-pound DB/WR, according to the UNH release. Eichman had Bryant, Merrimack and both Southern and Central Connecticut in the hunt, but the decision on UNH was a pretty easy one. “Ever since visiting sophomore year with my team, I liked the school pretty early,” said Eichman, who is currently in the middle of hoop season at Merrimack High. “A lot of it came down to the regular campus life. If things didn’t work out (for whatever reason football-wise), I’d still be very happy there. Eichman, who earned his stripes in high school as a big-play style running back, is ready to play on either side of the ball when he gets to Durham. He’s going in open-minded, just like he is in the classroom where he’ll be undeclared to start with an eye on kinesiology in the back of his mind. UNH is currently riding a streak of 14 straight playoff appearances in FCS, coming off a triple to the national quarterfinals this past season. “They’re not only consistent, but it’s such a winning culture, a really good place to be,” said Eichman. 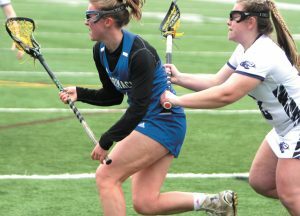 Both Duval and Eichman will play together on the CHaD All-Star team later this year before heading across Route 101 to the Seacoast in late summer.